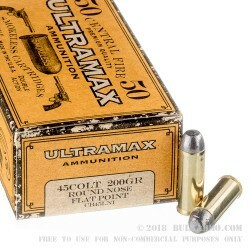 UltraMax is a small batch ammunition producer that has a dedicated Cowboy Action line of lead based 45 LC cartridges that are purpose-built to replicate traditional loads from a time gone by. The loadouts of this line are perfectly mated to the modern sport of Cowboy action shooting, without giving up anything from the traditional, nostalgic feel of the sport. The consistency and reliability of this load and the style of the build make it a very well balanced, easy to control round, despite being a big bore caliber. 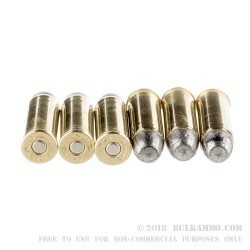 The 200 grain load for the .45 Long Colt load here is a classic offering and gives excellent performance for Cowboy Action work including a relatively mild recoil profile considering how strong the load is already. 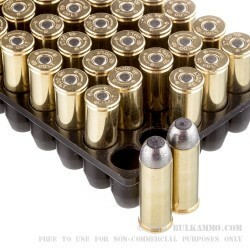 The super accurate load style makes this well suited to cowboy action competitions or for target or general use, where you prefer the nostalgia and performance of older styles of ammunition. UltraMax is a South Dakota based manufacturer that has a long history as an authorized law enforcement ammunition provider for large companies including some of the largest ammunition manufacturers in the game. They know a thing or two about production of top tier ammunition, and this shows in their offerings under their own umbrella. Q: What is the rated velocity? For example, many suppliers rate their loads at either 700 or 850 fps. A: Hello Curtis, Ultramax lists the muzzle velocity of this specific 200 grain round at 700 fps.